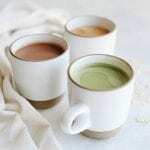 Blend the boiling water, matcha, coconut butter and sweetener if using together in a blender or using either a hand whisk or electronic frothing wand. If desired, froth the milk using an electronic frothing wand and pour it over the matcha mixture. Place all the ingredients (except espresso) into a small saucepan/pot and heat over medium low heat for 3-4 minutes, making sure not to overheat. If desired, use a hand whisk or electronic frothing wand to froth mixture. Add espresso to mug (if using) and pour oat milk mixture over top. Steep the chai in a mug with the boiling water for about 7 mins or until it is deeply brewed and concentrated. Remove tea bag or tea leaves. Meanwhile, heat the oat milk over medium-low for 3-4 minutes, stirring in the sweetener. Once the chai is brewed, pour the milk into your mug. Add shot of espresso if using.